Note for English Version: Inside Yunotsu Port, there are three breakwaters running from the north side land. To discriminate them, we call them (A), (B) and (C) in order from the west (seaside) as you see on the map. (A) breakwater is located outermost in the west. There is a white lighthouse with a green light at the top of (A) breakwater. The area between (A) and (B) breakwaters is a quay for work ships. (B) breakwater is located between (A) and (C). 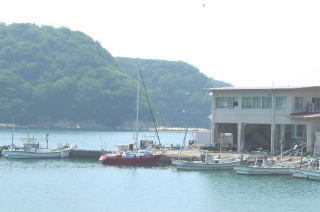 The area between (B) and (C) is a fishing port, which has Gyokyo office, i.e. 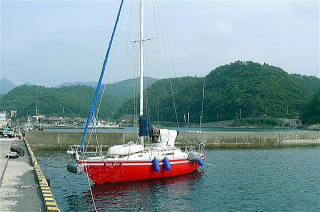 (C) breakwater is located innermost in the east of Gyokyo. A boats pool is in the east of (C) breakwater. I bothered about a southeast wind this time. As Yunotsu Port has mountains in the southeast, I had thought the southeast wind should be weakened. But, the wind was rather strengthened. It was like a wind path. This time, first, I moored at the quay for work ships between (A) and (B) breakwaters. Second, I moved to the fishing port quay closer to (B) between (B) and (C), then moved to the seaside (west side) of (C). While Gyokyo accepts basically a berth closer to (B) between (B) and (C) and another berth at the east side of (B) only, they guided me to the west side of (C) because there was a festival at that time. As (C) is a very low breakwater, be careful with your fenders positions. 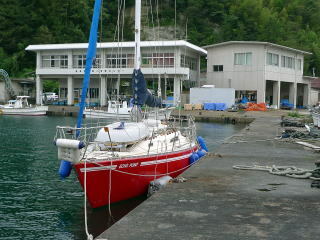 The quay between (A) and (B) for work ships are always open for mooring, because that area is beyond the jurisdiction of Gyokyo. No status change from 2009 below. You should not think about mooring at the boats pool. 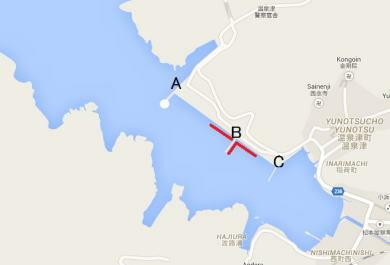 As there is a loading place in front of Gyokyo office, you moor at the quay closer to (B) between (B) and (C). If it is full of fishing boats, moor at the quay between (A) and (B). I moored hear this time. As the distance between bitts is about 30meters, you should be prepared with long ropes. You head straight to the white lighthouse with green light. The lighthouse is not so visible from the distance. Around the entrance of Yunotsu Port, there is the first breakwater running from the northeast. Then, the second breakwater is running from the southwest. After passing by the second breakwater, you will pass by the white lighthouse at (A) breakwater on your left. Ask Gyokyo office directly for your berth. Otherwise, advices to your berth vary person to person in the fishing port. They are kind and not rejecting sail boats though. A 24-hour-open clean western style toilet is at the tourist information office in front of the port. Water is available at the toilet. The toilet at Gyokyo can be OK for a small bucket of water. There is a small supermarket 3 minutes away. Another bigger supermarket is 7 minutes away on the way to the station. There is one at a national highway beyond the station. I called Ogawa Shop at 0855-65-3122 to deliver 80 liters of fuel. As Yunotsu is an Onsen sightseeing place, there a few restaurants in 10 minutes away. “Moto-yu” is a wonderful homespun Onsen bathhouse and opens at 5:30 early in the morning. “Yakushi-yu” is another good one. Both fees are JPY300. Yunotsu was the port of Iwami Silver Mine, which produced one third of the global silver in 17th century.